Kanching Rainforest Waterfall, also known as Kanching Recreational Forest, is set in a forest reserve of nearly 500 hectares in the Rawang district just north of Kuala Lumpur. Its close proximity to the city makes this forest park a very popular spot for picnics, camping, swimming and jungle walking especially at weekends. The park is also popular with photographers who like to try out their talents at snapping fast moving water, a skill which sadly I have not yet mastered! I went there recently on a weekday with my son. There were other people around but it was far from crowded. Overall I was impressed with the natural beauty of the place, particularly the stunning waterfalls which cascade a total height of around 120m spaced over seven levels. On entering the park you will immediately see a clean stream where children can paddle around safely. 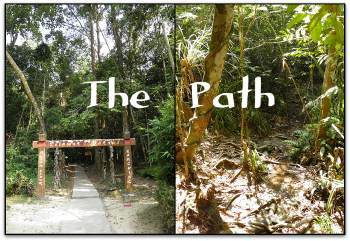 Further up, the route follows cement footpaths and steps which take you to the first 4 levels of waterfall. 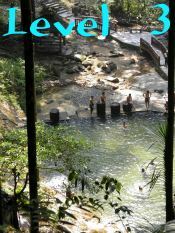 Levels 2 and 3 (102m and 120m respectively) are the most popular spots where people can enjoy a natural power shower under the cascading water or just swim and wallow in the clear fresh pools. There are picnic gazebos here, together with changing rooms and toilets. Most visitors do not venture beyond level 4 (140m) where the concrete steps end and the trail becomes slightly more difficult. 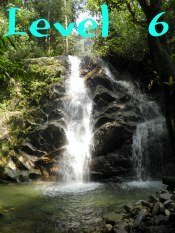 With a little effort you can reach the highest waterfall (level 7 - 208m) in under an hour from the starting point. It is certainly worth the effort as the more spectacular falls are at levels 6 and 7. There were only two other hikers at this level during our visit. On the way back to the car park we passed a troupe of monkeys foraging for food from passing tourists. One cheeky monkey made off with the ice cream of an Arab lady. Tourism Malaysia has obviously done a good job at promoting this park as there were a lot of visitors from the Middle East no doubt enjoying the greenery and water which is lacking in their home countries. Verdict: A nice place to spend half a day. Want to see some more waterfalls? 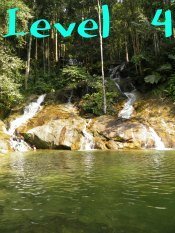 I can recommend a great website called Waterfalls of Malaysia for an expert guide on everything you need to know about Malaysian waterfalls. 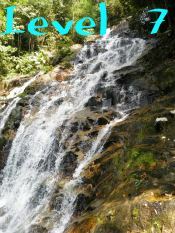 This waterfall is easy to get to by road from Kuala Lumpur. Take the Lebuhraya Rawang (route #1) which is basically a continuation of Jalan Ipoh. Heading towards Rawang you will see the park on your right a kilometre after Templer Country Club. If going on a weekend, get there early as there are limited parking places. Entrance fee RM1 and parking RM2. 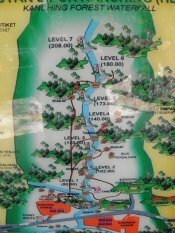 Various travel agents in Kuala Lumpur can arrange tours to the park. - Bug off. Some people have come across leeches in this park but we did not encounter any. See my leeches information. - Water. - Swimming stuff if you are planning a dip. Return from Kanching to National Parks. Return from Kanching to Home.